What is a Phantom Zucchini? Well, a zucchini is a vegetable, a very mysterious vegetable. Many people like it, but they don’t know why - because it really has very little taste. Just like most vegetables, it is supposed to be a healthy choice but...a phantom zucchini is different. It looks and acts like the real thing, sort of like a phantom arm or leg (one that was amputated and yet the owner claims to still feel it from time to time) but don’t be fooled. It is not what it appears to be. Who is this phantom? 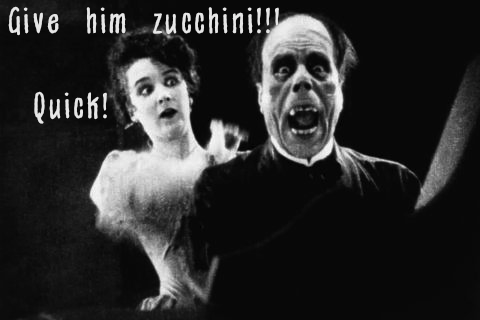 Well legend tells of a man who loved zucchini, and who was also a very well respected organist at the local church. He was hired to be the back up organist, available when the regular guy couldn't make it. But he used his satanic powers to brainwash the congregation into believing he should be the one and only person to play that scary sounding instrument. He had them believing that no one else had ever managed to play quite so hauntingly. And also? He brought the choir a little treat every Sunday. Some homemade sweet cake or bread or cupcakes or cookie or pie all made with one ingredient in common. Yes, ">ZUCCHINI!!!!! Eventually the whole choir and some of the other churchgoers became The Disciples of Phantom Z. (You might have heard of them,) zombie-like beings wearing raggedy clothes who walked dragged themselves through the streets at night and broke into houses looking for a zucchini fix. The jilted choir director, who, interestingly enough, read a lot of occult fiction, and had a library of old scary looking hardcover books that he was especially proud of, had heard about the legend of The Phantom Zucchini and knew that something had to be done, something big, something quick and something with a lot of fiber. So he invited the Disciples over to his house for a "No Hard Feelings" get together and served them a cocktail spiked with carrot juice, garlic salt and some holy water and they all walked home without dragging and changed their clothes. Now, what does this all have to do with my blog? Well, nothing really and ABSOLUTELY EVERYTHING!!!!! Yes, you guessed it. I, too, fell under the spell of the Phantom Zucchini and I tried everything to break the hold this vegetable had on me. At certain times of the day I would find myself rushing to the supermarket, buying a zucchini and not even bothering to cook it. No, really, I'd eat it raw while driving home. I spent all my money on Zucchini and my car was repossessed. I started growing zucchini myself. It grew as large as trees, and crept into the neighbor's yards. Finally in a dream the Phantom Zucchini came to me and said "Thou Shalt Change Your Name to Princess Stupidhead, and Create a Blog in My Name and Post Regularly About - Well, Anything, Really, and as long as that blog Shalt Please Me, I Will Let You Remain Free of My Quite Awesome Powers of Possession and Your Head will no longer twist round and round, and you will start to like carrots again. Yeah, so I'm in the clear, but you guys - well they say after a while you no longer smell the garlic.